Are you ready to trade up to tinted lip balm's big sister? The beautiful gold Yves Saint Laurent tube tells you immediately that this is something worth holding. But more than that you should treat yourself to Rouge Volupte Shine , because it's ultra moisturizing -and now in one of the best pinks they've ever made, 6 Pink in Devotion. The texture of this is featherweight - but oh so creamy and soft on the lips. With just a few swipes of Pink In Devotion, a flattering, slightly blue-based fuchsia pink just popped off my skin - making me smile instantly. The formula is also very moisturizing, which combined with the fact that the color still adheres well to the lips, is fabulous. The finish is shiny with just a faint layer of shimmer, which can be seen when the majority of the pink wears away. 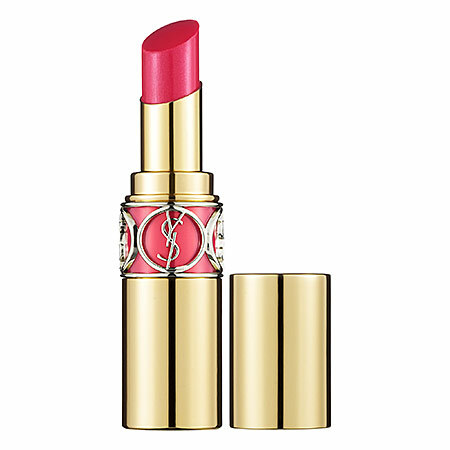 There is a scent, like with most of the YSL lip products, which is slightly fruity/melon, but dissipates fairly quickly if that's a concern for you. The great benefit this lipstick has is that it's not sheer - there's a very nice level of pigment in it. But it's also not quite a full coverage product. This is perfect for summer months and on more laid back weekends when you want simple face makeup and a nice lip that doesn't need a lot of work during the day to maintain.